HOLLYWOOD DIRECTOR CHRISTOPHER Nolan is known for bringing high-concept fiction to the big screen, but for his new film Dunkirk he turned to a historical event. And it was no small task – in order to bring the story of the World War II evacuation of troops from the Dunkirk beach in France to England he had to film on land, sea and air. 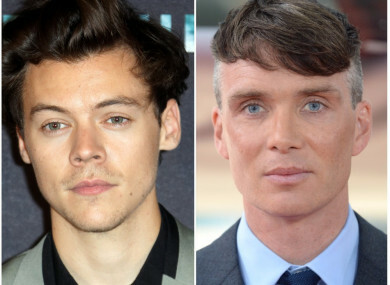 So for the actors taking part – including Ireland’s Cillian Murphy and Barry Keoghan, former boyband member Harry Styles, Scotland’s Jack Lowden, and Englishmen Fionn Whitehead and Tom Glynn-Carney – that meant hours in the sea or cooped up in a real-life fighter plane. In our exclusive interview with Nolan, we found out about the huge amount of work that went into bringing the audience into the throes of the evacuation. And when TheJournal.ie sat down with the above actors, we grilled them on working with such a big name – and what it was like filming on such an intense set. Here’s what they told us. Cillian Murphy (‘shivering soldier’): I’m Irish so we really don’t learn about it – I certainly didn’t learn about it growing up in school… it was only really when I started this if I’m honest that I started to read about it and really see how much of a turning point in the war that it was. Barry Keoghan (George): I didn’t know about it, I didn’t learn about it in school or anything so I stayed that way for prep. I didn’t want to know what I was going into and I think that played as well to my advantage. Cillian Murphy: Being in it you’re sort of aware all of the time this actually happened and people lost their lives and so that feels quite humbling all of the time, it’s always in the back of your mind I suppose. But you can’t let it come to the forefront of your mind because you have to focus on doing the best job that you can. Tom Glynn-Carney (Peter Dawson): I don’t know if a lot of people know about Dunkirk, especially my generation, our generation. I certainly didn’t have a wealth of knowledge about the events when I was in school. It was covered in curriculum history but very, very briefly. [But] we obviously had to learn a lot about it. Harry Styles (Alex): I think it’s a story that’s not the best moment for [the UK] in the war, so I think it’s often washed over a little in the way it’s told and almost a fairytale way… And what I love about this film is it’s obviously so much more about the human aspect, it’s not looking at these people as a statistic, it’s individuals who are going through these things. I think all the pressure on being in this film came from wanting to do such an important story justice. I don’t think anyone really thought about anything outside of that. Fionn Whitehead (Tommy): You might not even have a teacher sit you down and say ‘this is what the Dunkirk spirit is’, but it’s so present in everything you read in history books and everything like that… there’s just a feeling of coming together to support each other through a crisis, which I think is an amazing thing. Jack Lowden (Collins): So it’s partly based in the reality of what happened and partly through myth, it’s a very mythical term, [Dunkirk spirit]. And I think what this film does, is that I think it really does show the brutality and realism of it rather than… I don’t think it’s a very ‘Hollywoody’ film. It’s not very glitzy, the fact it’s an ensemble cast. Cillian Murphy: He’s very, very hands on, it was just me and the actors and cameraman and Chris on the boat, and the sound guys. So on that tiny little boat for days, and days, and days, and it feels very intimate always. Because I’ve worked with him over the years I know what he wants, and I trust him implicitly so anything he says I’m willing to go there. Tom Glynn-Carney: Just the most phenomenal experience. I’ve always wanted to work in film and work with directors like Chris, and actors who are so world renowned and talented as they are. So to be a fresh drama school graduate and have this as my first job was just mental really. I felt quite out of place at the start, like an elephant with an umbrella, but it was great actually. Cillian Murphy: I did an audition for Batman, which seemed like a stupid idea at the time, and I was just a fan of his – I was a fan of Memento and Insomnia. So that obviously didn’t work out and Christian Bale was the perfect Batman and then he gave me the other part [Dr Jonathan Crane] and I enjoyed it, it’s a privilege you know, every time it’s a privilege. Harry Styles: I think any opportunity to work with people you’re a fan of always feels like a privilege, so I think getting to work with such an amazing group of actors and an amazing crew who are obviously some of the best at what they do and obviously getting to work with Chris is amazing. Cillian Murphy: He’s very, very rigorous, he’s very demanding, he wants to be the best he can be and he wants to challenge the audience. I think for an actor that’s very inspirational because you don’t you never want to just do something just because you can, or just because it’s easy or just because you can make money or whatever, you should do something that will hopefully last or have an impact or affect somebody. Tom Glynn Carney: [Chris] was in the middle of the action always getting involved, right next to the camera – something needed throwing into shot, Chris would throw it and that’s very rare for directors. You speak to more experienced actors who’ve done more films and they say that the director is often in a tent a few yards away giving directions on a radio. Barry Keoghan: Being part of a Christopher Nolan movie, he is one of the list, on your list of people you’d like to work with – you go ‘yeah, I’d love to get around to him one day, that would be an unreal opportunity’. To have that in your 20s and to have that as your first film I mean, you know… But you can’t let that get in the way either – ‘Chris Nolan movie’. Chris has that thing on set, you don’t have that feeling, you’re just making a movie. Cillian Murphy: You put yourself under the same pressure to do the best work you can… but for me if you think ‘that was pretty good’ then you’re fucked, you might as well forget about it, you know. Harry Styles: The only way that I think [being in One Direction] might [have prepared me for acting] is just not being really uncomfortable in front of camera. But in terms of the crossover I think they’re almost opposite, in terms of the music you’re trying to put so much of yourself in, and it’s so personal. With this you’re trying to remove being yourself from it. Cillian Murphy: You have to be [picky] really – you can work all the time if you want but then the quality will drop, I think. You have to be patient and wait for stuff that’s interesting, or that you think is interesting or challenging, or stories that are interesting and challenging, or directors that are interesting and challenging. Harry Styles: Everyone was very welcoming and everyone’s meeting everyone, you’re about to start this project together so it’s a very, very nice atmosphere. Cillian Murphy: [The IMAX cameras] are loud and they’re huge. On that boat some days it was swells like [gestures] that and the cameraman Hoyte [Van Hoytema], he’s like [holding] this thing and it must weigh the size of a donkey or something because it’s really big. I don’t think anyone’s done the things that Chris has done with an IMAX camera – had it on a shoulder, put it on planes. Even in the Dark Knight, the opening sequence. People said you couldn’t do the things that he’s done with the IMAX camera and he has. Tom Glynn-Carney: I think the most challenging thing was the first day, getting used to it all and being thrown into this film set that was of epic proportions. Being brand new to it and going ‘god, I’m going to be here for a few months, working with hundreds of people for a few months, so get used to it’. Harry Styles: My first day on set was maybe the worst weather we had so I very much felt like ‘what have I got myself in for?’. But it was great, it was good fun. I think it was very rewarding at the end of the day to get in bed… with each other [laughs]. And just bond that way. Harry Styles: I think the scariest part was the scale of the set, it was so large and there were real ships and it was very much the real stuff around you. So I think when things would break or things would sink, people would end up in the water when they weren’t supposed to be, but I think you quickly snapped into ‘yeah we’re on a film set but it’s also… it’s big machines and I’m small’. I just think realising you weren’t filming in a ‘safe set’ all the time but everyone who was around, the crew, were the best at what they do and obviously made us feel incredibly safe all the time. Tom Glynn-Carney: The weirdest thing was going back to the hotel after filming, ‘cos we’d be on that boat for 14 hours in a day just constantly out at sea. And then you’d get back and you’d be lying in bed and as soon as you’d close your eyes the room would go [up and down] and it would be doing that all night. Harry Styles: No one really complained about anything about it being difficult in any way. Everyone was so aware that what we were doing, it was obviously still a film set at the end of the day, and was nothing compared to [the real event]. I think Chris is able to put you in the situation physically as much as anyone can – it would be really difficult to get any closer in terms of the surroundings being the same. Fionn Whitehead: The script, as bare as it is, it was very stressful. I got that it was going to be an intense kind of ride. Dunkirk (12A) is in cinemas now. Email “'What have I got myself in for? ': Harry Styles and Cillian Murphy on acting and the challenges of filming Dunkirk ”. Feedback on “'What have I got myself in for? ': Harry Styles and Cillian Murphy on acting and the challenges of filming Dunkirk ”.